This RSMembership! 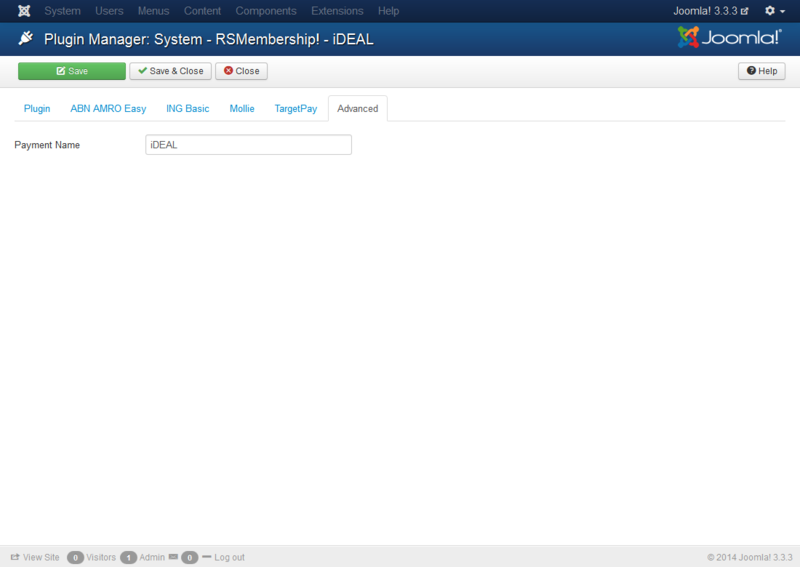 iDEAL Plugin is commercial and needs to be purchased separately. The price of the plugin is: 19 EUR. You can buy it by accessing Customer Area > My memberships > Active Memberships > clicking the 'Buy Extra Plugins' button of your RSMembership! license. To configure the plugin, head to Extensions >> Plugin Manager >> look for System - RSMembership! - iDEAL and edit it. 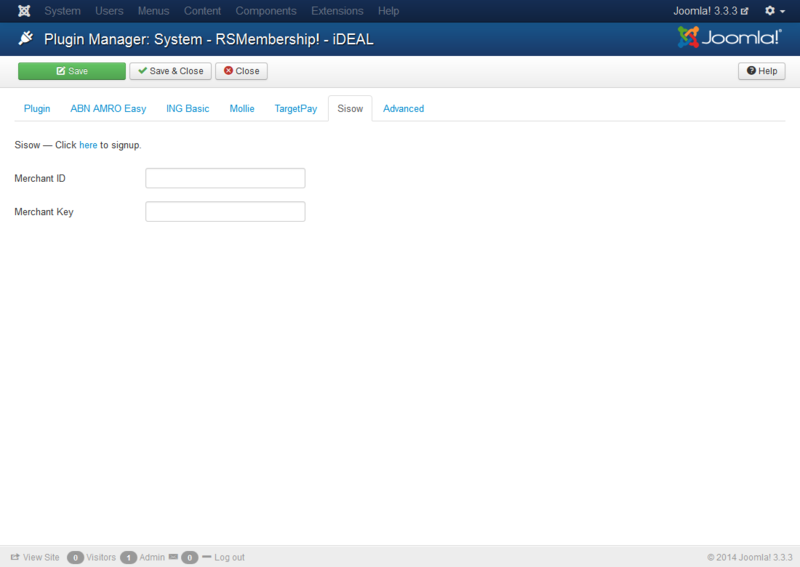 You'll notice that there are 6 configuration tabs, two of which regard the plugin's general configuration, the other 4 being addressed to each type of iDEAL account. Payment Mode: Test / Live - choose whether you wish to Test the plugin on a development website or go Live with actual payments on your online website. Custom Item ID: If you'd like an Item ID appended to the pages redirected from the payment gateway, please specify it here. (optional) Tax Type: Percent (%) / Fixed Rate - if you wish, you can charge an additional tax. Choose whether the tax is represented by a percentage of the total value or by a fixed rate. (optional) Tax Value: works in conjunction with the Tax Type field. Specify a value that will be regarded either as a percentage or a fixed rate. 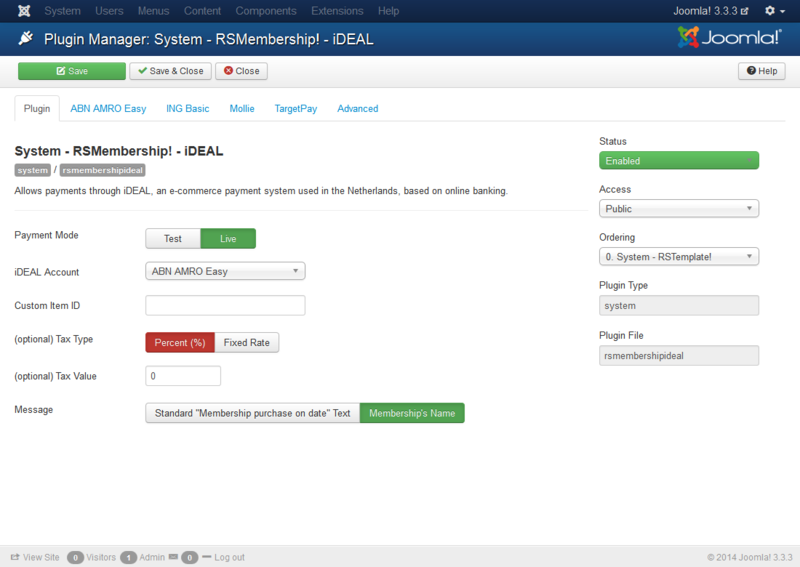 Message: Standard "Membership purchase on date" Text / Membership's Name - this is what the user will see in his shopping cart. Payment Name: defaulted to iDEAL, this is the name that gets displayed when choosing the payment option during the checkout process. Each type of iDEAL account that the plugin is compatible with gets configured in a special manner and has its own configuration tab. Every tab contains a link through which you can sign up for that type of account. 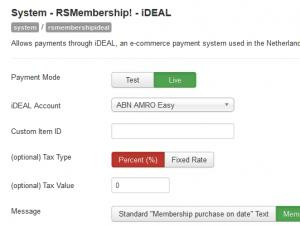 PSPID: When creating an ABN AMRO Easy account, you will be given a PSPID, type it in this field. Merchant ID: enter your Merchant ID provided when you created the ING Basic account. Secret Key: enter your Secret Key provided when you created the ING Basic account. 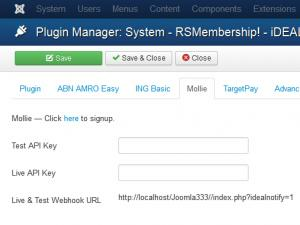 Test API Key: If you are on a test site, enter the Test API Key provided when creating the Mollie account. 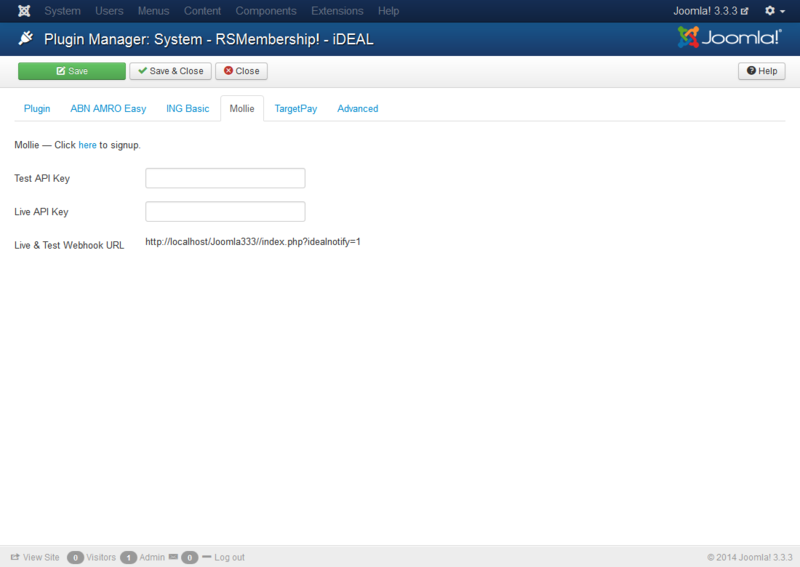 Remember to also set Payment Mode to Test in the Plugin tab. Live API Key: If you are the live site, enter the Live API Key provided when creating the Mollie account. 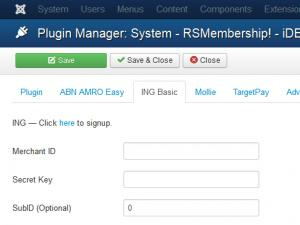 Remember to also set Payment Mode to Live in the Plugin tab. Live & Test Webhook URL: use the URL automatically generated here to configure the webhook URL of your Mollie account. Layout code: When you created the TargetPay account you were also given a Layout code that can be found in the TargetPay account's configuration, please enter it here. Merchant ID: Enter the Merchant ID that has been provided to you when creating the Sisow account. Merchant Key: Enter the Merchant Key that has been provided to you when creating the Sisow account. Important: Recurring payments can be implemented, but the iDEAL payment processor does not allow for them to be done automatically.